In 1863 the town of Truckee did not exist. Native Americans roamed the region. Joseph Gray believed that this would be a good place to build a way station. Henness Pass Road and Dutch Flat-Donner Lake Wagon Road converged here. In a few years, the Central Pacific Railroad would complete the Sierra Nevada crossing of the first transcontinental railroad. Gray's Station sat alone beside the only road. The small cabin served ladies and gentlemen traveling in six-horse stage coaches and teamsters wrangling thirty-horse freight wagons. Gray owned mules, horses and a number of wagons which hauled freight from Grass Valley to Virginia City and the Gold Hill Districts. He stored huge supplies near his cabin for winter consumption. 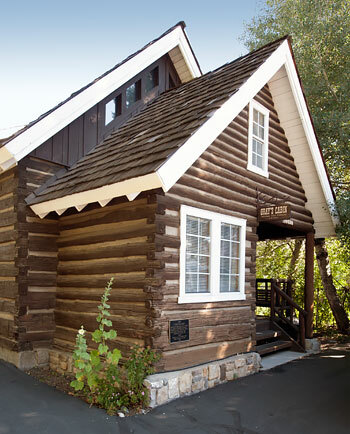 In 1907, the Native Sons and Native Daughters of the Golden West moved the cabin to its present location by taking the entire building down, piece by piece, and reconstructing it at its present site. In the 1950s, the building was extensively remodeled for use as a residence. Subsequently, an addition was added to the rear. The Old Stone Garage, built in 1909, stands on the original site of Gray's Station.